Our raspberries are coming in! �We all like raspberries but Julie LOVES them. � Every day she goes by the vines and grazes on the berries. �So the other evening �she had went to close the chicken lot gate and thought she would pick her a few berries while she was out there. �As she was picking she noticed a calf very close to the garden fence. �She thought she would keep an eye on it as it looked like it was thinking about trying to get in the garden. �She picks a few more berries and hears the calf make a strange noise. �She looks at it again, it looks at her and guess what? �It is not a calf but a bear!! �Probably about 100 ft from where she is!! �She starts walking slowly back toward the house. 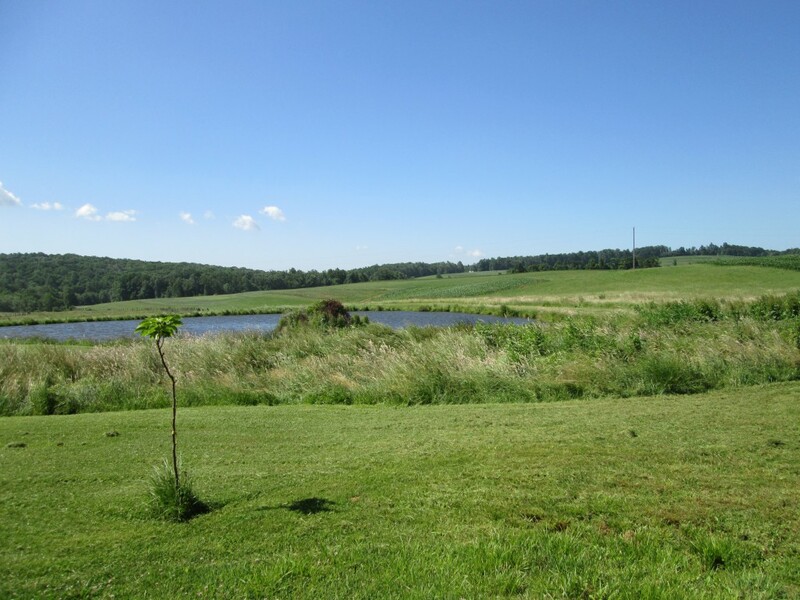 �The bear notices her movement and starts slowly going up the field. �She comes and gets us to see it. �It goes up the field to the top of the hill and then goes under the fence and out into open pasture (hopefully not to return). 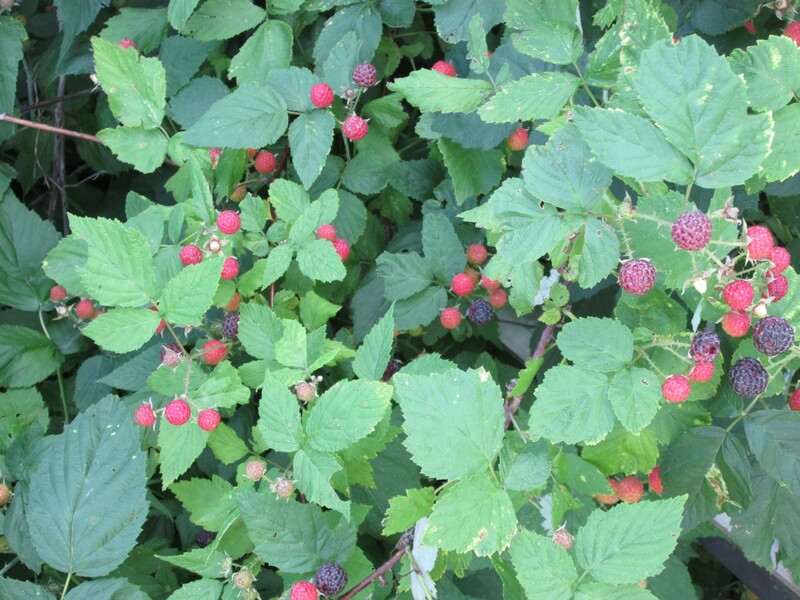 �Julie then returns to picking her �raspberries. �I told her I guess that means she is a true country girl-not even a bear can stop her from picking berries!! I thought I would share a few pictures with you all today. 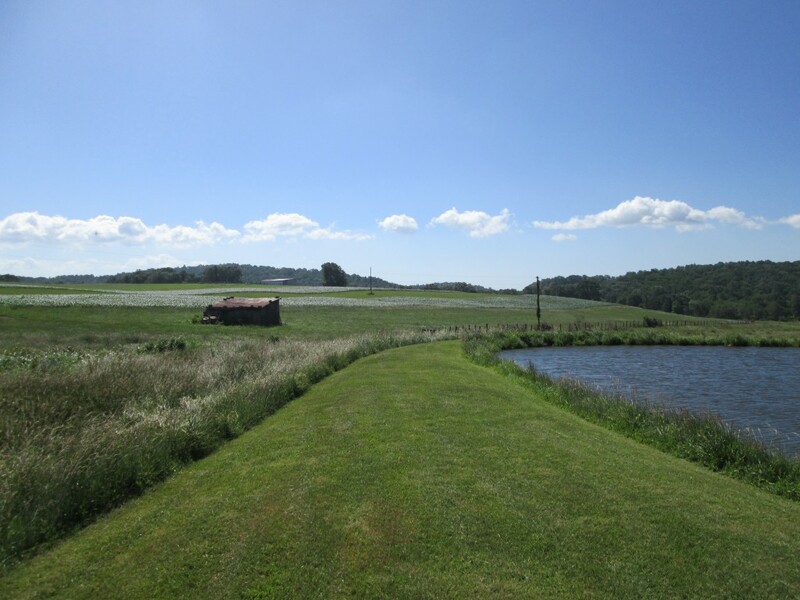 �We have been enjoying BEAUTIFUL weather here in Floyd. I took these pictures the other day as I was mowing. 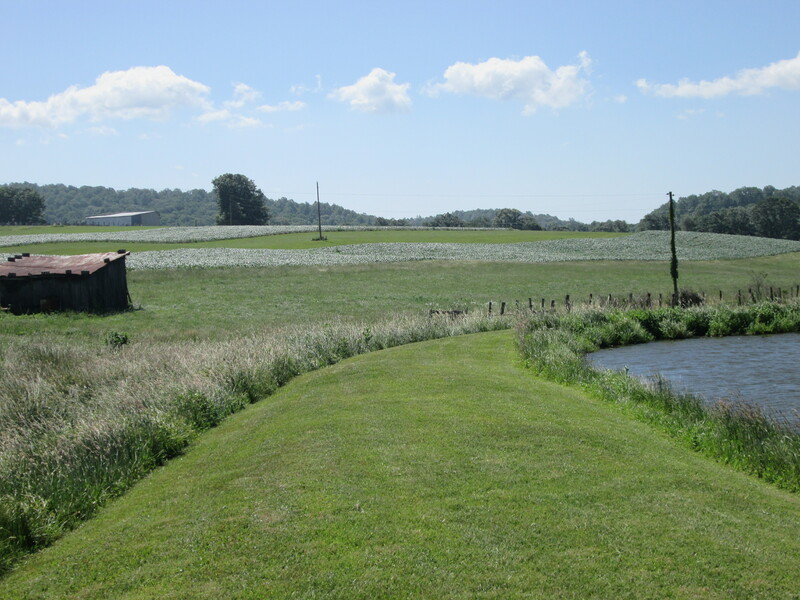 �We keep this little pathway mowed going down to the pond. This is the view from the lawnmower. �I was hoping to show how pretty the corn rows looked. �The sun was shining and the wind was blowing. �It was beautiful. 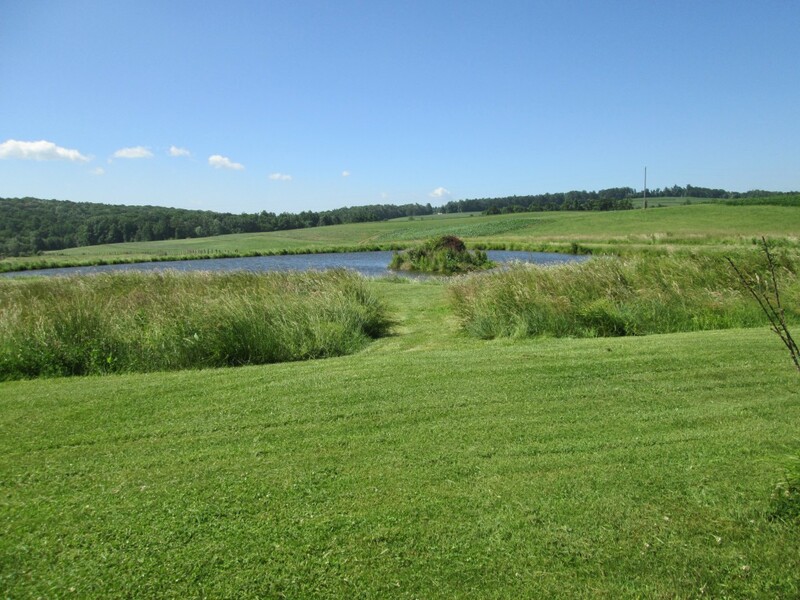 �Mowing around the pond is my favorite place to mow. �I consider myself so blessed to live where we do. Can anyone guess what we are having for supper? �That’s right, you guessed it, peas!! �This is very exciting for us as we have not raised peas in several years because they just didn’t seem to do well here. �Well, this variety is doing excellent. �I don’t know, maybe we got them planted at just the right time but whatever the reason they are loaded with beautiful peas. 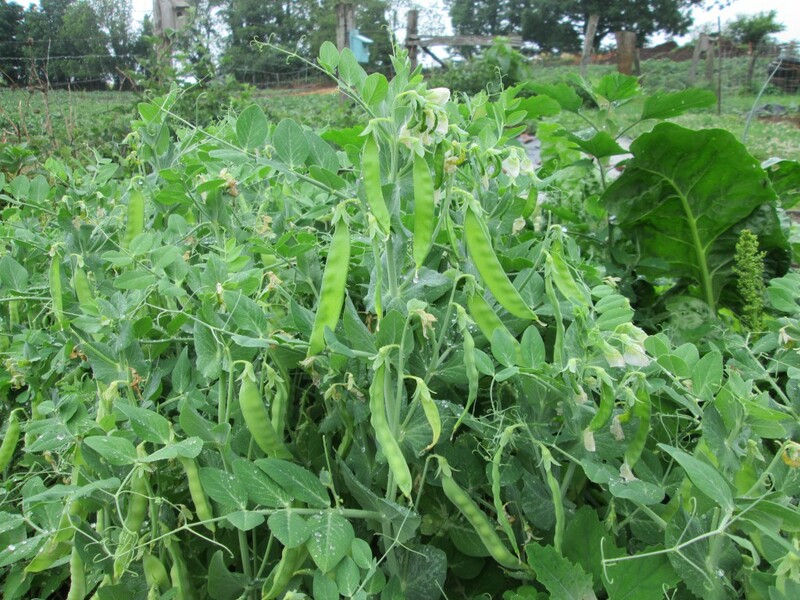 �This variety of pea is called snowbird and we ordered them from Burpee. �My mother used to plant these when we lived in Grundy and they always did well. �I was thinking about them this spring and wishing I knew the name of them. �It occurred to me to check in the freezer as I still had some seeds saved from my mom in there. �Guess what, an empty package was in there with the name and the product number on it of these peas. �If you look in Burpee’s catalog this pea is not shown. �However if you type in the product number it still comes up on their page. �I was so happy. �Also with these peas we will be having swiss chard out of the garden. �This is a new thing for us. �I don’t remember ever raising chard before so we will see if we like it or not. �For dessert I fixed an applesauce pie. �Can you tell�Hubby is home and doing amazingly well for all he has been through. �He went outside in the yard today for a while and sit in the green swing. �We are both so thankful for everyone’s prayers and ask you still continue to pray. Just a little reminder this morning that God always keeps his promises. �As I was sitting in my swing �this morning drinking my coffee this is what He showed me. 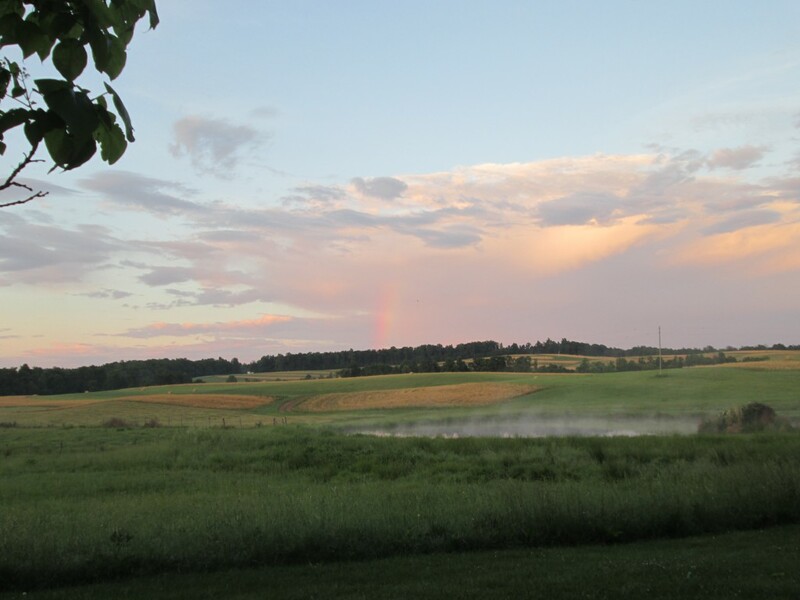 � A beautiful rainbow-no rain- just the rainbow. �I know many of you will understand this when I say, I considered it my personal reminder from God that He loves me. �Sometimes I just need to know that and I love all the special ways He shows it to me. Hubby is doing very well. �He was given a clear liquid diet yesterday and he said jello tasted delicious. �Hopefully he will get real food today. �He is doing a lot of walking as they have said this will speed up recovery. Well, much to do here so I better get busy. �Enjoy your day and God bless.